Heat a non-stick pan over medium-high heat. Mix all spices together-garlic powder, cumin, cayenne pepper, salt, and ground black pepper and coat the chicken with the combination of spices. Add oil to pan; once the pan is coated with oil, add chicken to pan. Cook chicken for about 4 minutes on each side or until done. Once chicken is cool, cut in slices. 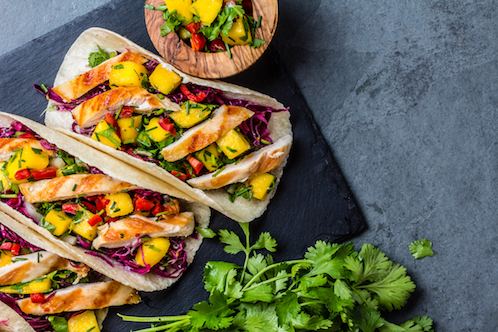 In a medium bowl combine the mango, red onion, and cilantro and fresh lime juice.